Consider all the terrible stuff that will never happen now. It’s never a good idea to fill your head with countless negative possibilities—unless you and everyone else in your life is about to get snuffed out like a light! Now is the time to unleash all of your worries about the future like never before. Since you have no future, that means that you won’t get cancer or die in a plane crash or get maimed in a freak accident like you always suspected. You also won’t get fired from your job, you won’t lose your house to bankruptcy, and your dog won’t die of some terrible dog disease (You just killed her to make dog jerky, remember? Phew!). That could have been a speech in The Remnants. Oh, alt-universe. Sometimes I miss you. Which project should I write? I know you have addressed this type of question to a certain extent, but I was left wanting more of an explanation that I hope you can provide. I have four ideas in my head for four different stories. When I start working on one, I think I am making a mistake and I should concentrate on another one. I will then switch and after a little bit of time, I feel the same way that made me move to this story. When you have multiple ideas and aren’t certain which idea is the right one to focus on, how do you resolve that? This will never end. It will continue to be a problem as long as you write. I’m certain that Stephen King, even after umpteen books, wrestles with this problem. In fact, his prolificacy might be a coping strategy; rather than decide which thing to write, he just writes them all. At this moment, there are no less than fifteen projects competing for brainshare in my head. Five of these are things I’m contracted to write, while the other ten or so are old ideas, recent ideas or things that just occurred to me as I walked up the stairs to my office. So which projects do I write? Well, I should write the ones that I’m being paid to write, and more specifically, I should work on the one that is next due. So I spend the bulk of my writing time on the project with the nearest deadline. Honestly, that may not be the project that excites me the most at any given moment. But I’m getting paid to do my craft, so I’m certainly not going to complain. But what about those other projects, the ones I’m not currently writing? They’re battling it out in my subconscious, each trying to get my attention long enough that I’ll recognize how worthy it is. Sometimes they’ll even gang up on me: The Nines was three separate ideas that conspired to fit together. We’re sort of about the same thing. The difference between an actor and a creator. Hey guys, what are you talking about? We’re trying to get John’s attention. Wait! Wait! What if the pilot that they’re shooting in my story is actually Spooky Story? John likes things in threes. Like Go. What if your main character was my main character and also your main character? And we know that because they’re all the same actor. Quick! Get him while he’s in the shower! Some “old” ideas get written this way. Others simply recede so far back they’re nearly forgotten. That’s okay. You’re not going to become best friends with every nice person you meet. You’re not going to write every good idea you have. In some cases, simple timing makes a new project suddenly possible. For the Alaska pilot, I pitched it to the network within a week of having the idea. The Remnants was possible only because the WGA strike meant I couldn’t work on any of my “real” stuff. If you have four ideas, all equally viable, I’d recommend writing the one that has the best ending. That’s the one you’ve thought through the most, and the one you’re least likely to abandon midway. But whatever you do, just pick one and write it without delay. If you have great ideas for your other projects, absolutely take some notes, but don’t switch. Finish what you’re doing, or you’ll have a folder full of first acts. I was happy to get such a strong reaction since posting the pilot for The Remnants. Every few days, we get a surge of hits as new sites link to it. A fan even set up Draft The Remnants to get people to pledge their love. For something that’s been sitting on a shelf for a year, it’s really gratifying. Viewers had a lot of questions, so I’ll do my best to answer them here. It’s actually not about zombies. When I pitched the show, I described it as a cross between The Office and The Stand. Something Very Bad has happened, but we’re focusing on the survivors and their dysfunctional attempts to reestablish normalcy. Like Stephen King’s book, there are good people and some very bad people — but they’re not the living dead. I completely understand why viewers might expect some shambling corpses. Mia claims that she’s “not one of them,” and former group member Stan apparently “went Jurassic Park.” The bad people, “them,” are truly scary — but also incredibly organized and sneaky. Think fascist. In the final scene, Mia and Josh both admit they don’t really understand what happened. That’s important. It’s nano-technology from the future. The correct answer is an amalgam of all three. How did you get that cast? I knew Ben Falcone and Justine Bateman, so I wrote those parts with them in mind. Ze Frank is a friend of producer Matt Byrne, and I had a hunch he could act. So I wrote the part hoping he’d do it. Robert Ulrich, who’s been my casting director on several projects, graciously agreed to help me find actors for Chas, Mia and Wallace. You’d think that given my credits, it would be easy to get people in to meet and/or audition, but several agencies simply refused to send their actors out for a web series.1 I deliberately hired people with a writing or improv background, because I knew from shooting Part Two of The Nines that I’d need to let people veer far off the script in order to get the feel I wanted. Because Justine is very active in SAG, she got us to test out their new web series agreement, which basically allows guild actors to work on experimental projects like this for less than scale. 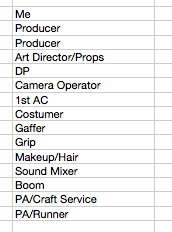 From cast to crew, everyone got about $120/day. How long did you shoot? How much did it cost? We shot three pretty easy days, with most departments getting a day to prep and a day to wrap. With six actors and a fair amount of improv, I didn’t want to feel rushed. We shot two cameras (the HVX-200) most of the time, generally gunning the same direction for a wide and a close-up. All in, the show cost $25,003. Depending on your perspective, that’s either expensive for a web show or mind-blowingly cheap for television show. We paid for locations, permits and other details a scrappier web show would just ignore. And we had more crew. Some web shows are literally just the actors and a guy holding the camera. We had 15 people. We were more like an indie feature, but without trucks or trailers. We could have done it cheaper. Of the $25,000, more than $17,000 went to pay people, and a lot of those folks probably would have worked for free. But I didn’t want to do anything I couldn’t replicate for a series of 10 episodes. You can’t ask someone to work for 25 days for the love of their craft. I saw the pilot as an experiment not just in storytelling, but production. I wanted to it to be sustainable. Why isn’t this a web series? There are at least five answers, all of which are obstacles. The lack of a major advertiser who wanted to sponsor it. That was the original goal: to find a company that would promote the show as hard as we would promote their product. Pringles is sort of a placeholder. We could swap that out for almost anything: Coke, Ace Hardware, Duracell. Actor availability. Every actor in The Remnants works a lot. The writers’ strike was a major reason why so many great people were available. And no, I’m not wishing for an actors’ strike. My schedule. I don’t know when I could do it. I haven’t announced the post-Shazam projects I’m working on, but trust me, I’m really busy with features. Doing ten episodes of The Remnants would be three solid months of work. The lack of a viable business model. A series of ten similar webisodes wouldn’t cost that much (maybe $300K), but there’s still no model for how investors could get their money back. If I thought there was, I’d pay for it myself. My ambitions. I need to write another movie to direct. The more things I put in front of it, the longer it pushes off that goal. All this said, I’ve been thinking a lot about The Remnants, and have mentally moved it from the “Impossible” to “Unlikely” box. What happened at the Grand Canyon? Something so awful it still gives me nightmares. When you’re auditioning actors for a role, the scenes as scripted are sometimes not especially useful. For example, if most of a character’s scenes are with groups of people talking, the auditioning actor probably won’t to have enough lines to really make an impression. And in television, you may need to cast a part that isn’t especially big in its first episode, but becomes more important later. Knowing this, casting directors will often try to cobble something together. But a smart writer should also volunteer to write special scenes just for auditions. Sometimes they’re cut-down and rearranged versions of scenes from the script, but it’s also an opportunity to just come up with something new. On movies and shows in which I’m involved with casting, I’ll generally give the casting director specially-prepared sides a few days before auditions begin. In the Library, I have an additional audition scene from Go for Mannie, whose character didn’t talk much but was crucial to the first act. And all the casting sides for the Alaska pilot. One added bonus of writing new scenes for the audition is that you don’t get completely burned out on the real scenes. After you’ve heard fifty actors read the same ten lines, they become meaningless. You don’t want to be on set hearing them again.